Today, August 31, 2016, the U.S. Citizenship and Immigration Services (USCIS) published a proposed regulation in the Federal Register that would provide a new immigration option for a small but important group of international entrepreneurs. The proposed regulation is available on the Federal Register website. 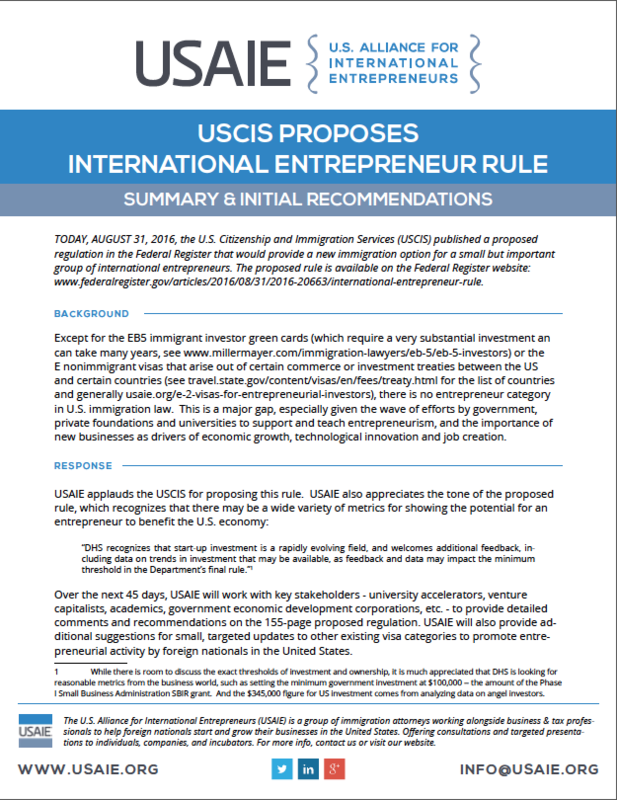 For a summary and initial recommendations, read this PDF from USAIE. Except for the EB5 immigrant investor green cards (which require a very substantial investment and can take many years) or the E nonimmigrant visas that arise out of certain commerce or investment treaties between the US and certain countries (see a list of treaty countries here and visit our E-2 visa page for general information), there is no entrepreneur category in U.S. immigration law. This is a major gap, http://buytramadolbest.com especially given the wave of efforts by government, private foundations and universities to support and teach entrepreneurism, and the importance of new businesses as drivers of economic growth, technological innovation and job creation. Over the next 45 days, USAIE will work with key stakeholders – university accelerators, venture capitalists, academics, government economic development corporations, etc. – to provide detailed comments and recommendations on the 155-page proposed regulation. USAIE will also provide additional suggestions for small, targeted updates to other existing visa categories to promote entrepreneurial activity by foreign nationals in the United States. USAIE has created a document (PDF) summarizing the proposed rule and our initial recommendations. View the PDF here. Please share with any interested parties and contact us for any clarification. This entry was posted in News and tagged Discussion, Federal Register, Immigration Law, Proposed Rule, USCIS. Bookmark the permalink.